This post on How to Make a Baby Shower Gift Basket for a Second Baby is a sponsored post on behalf of Mirum Shopper. All opinions are my own. Every baby is a gift to be celebrated. But when it’s not a first pregnancy and the baby is the same gender as its older sibling, trying to come up with ideas can be tricky. There are so many questions, that unless you have a thorough chat with the mom you might never know what she may already have or what she even wants or needs. You assume the basics, but then every mom has their own list of baby products that they like and will actually use. But it’s probably safe to assume that some things have gotten worn out between each baby using them. Or, that newer and better products are available that may not have been out when she was pregnant the last time. I love making a baby shower gift basket for a second baby (or even a third). It makes for a fun presentation to have a cohesive theme for your gift basket. Possible ideas for a baby shower gift basket could be bedtime, travel, or bath time. 1. Reusable container. This base that you put all of the actual gifts into is key. Choose an item that can be used again by the recipient. Having a dual purpose item and not another gift bag to throw away more than makes up for the lack of surprise overseeing the contents of the gift basket. I went with a metal pail that mom can use to hold diaper supplies or bath time goodies on the counter, but a baby bathtub would also be a fun option here to complete the theme (if of course, mom didn’t already have one). 2. Featured item for your themed basket. This is the main attraction. 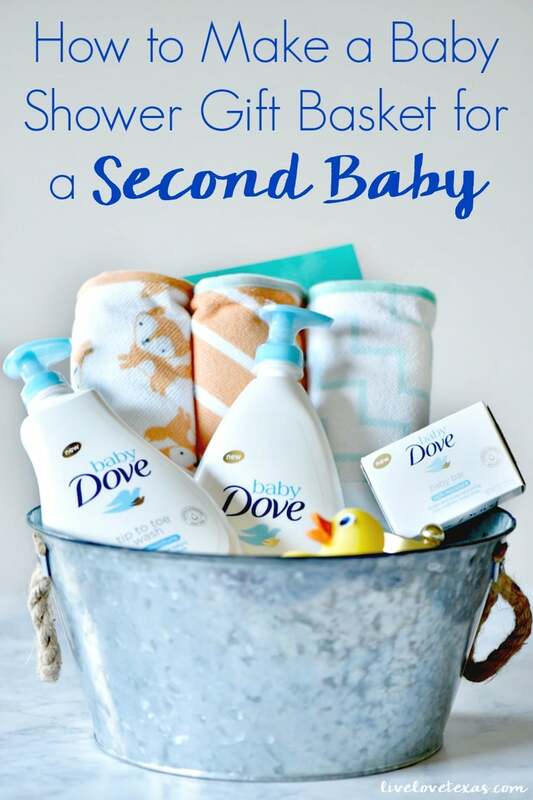 Since I went with the bath time themed gift basket, I wanted to introduce the mom-to-be to some of my favorite new baby bath products from Baby Dove including Baby Dove Rich Moisture Tip to Toe, Baby Dove Rich Moisture Lotion, and Baby Dove Rich Moisture Bar! Did you know baby’s skin loses moisture up to 5 times faster than yours? 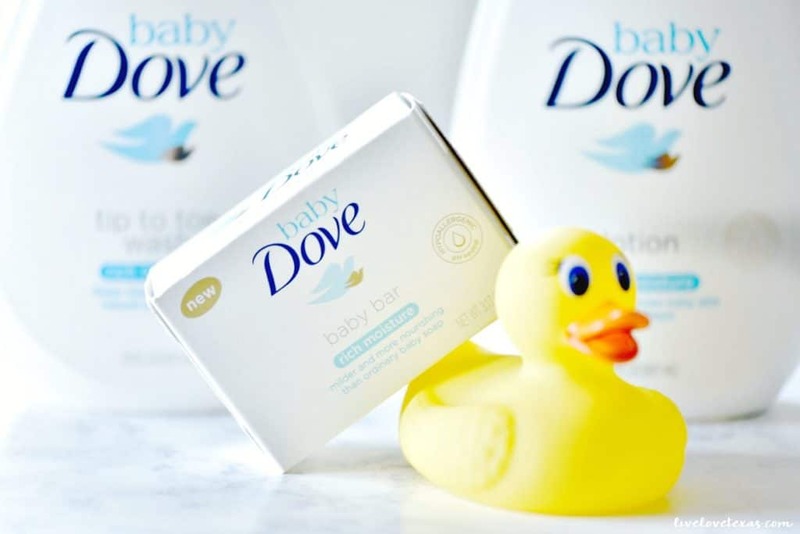 Baby Dove is designed to go beyond mild and gentle and actually replenishes moisture and nutrients while being tear-free! Who knows? Mom might even end up using these products on herself or older siblings – I do and love how much softer and more moisturized my skin feels when using them! 3. Accessories/filling. Instead of using tissue paper, add something to fill the gift basket that the mom can use when the new baby arrives. Since we went with a baby bath time theme, bath towels, washcloths, and bath toys are all fun additions. 4. Gift for mom. The mom-to-be needs to feel a little special too. Consider adding a small gift to the basket that’s just for mom! 5. A Card. Make it easy for the mom-to-be and include a card with your gift so she knows who to thank. If you’re already a mom, consider putting some of your favorite parenting blogs or quotes to entertain the new mom when the baby’s here and she’s up late at night.